Who Cares? Can caring responsibilities be combined with a successful academic career? Photo: co-organisers of the 'Who Cares?' workshop, Jennie Middleton (left) and Claire Hann. To consider these questions, in January the department played host to academics and equality & diversity practitioners from geography departments across the country, to share their experiences of being a parent or carer and working in academia. 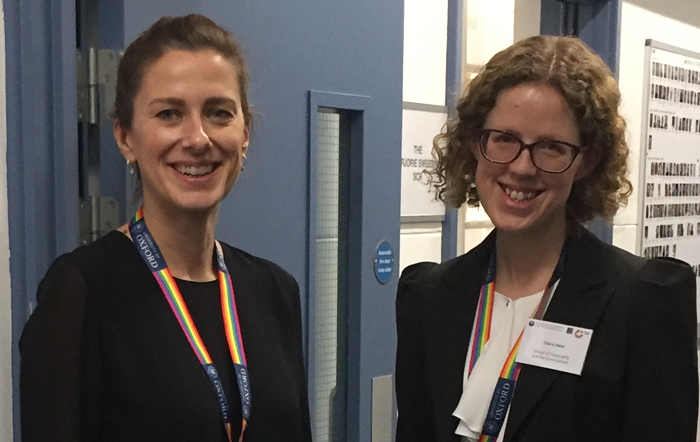 Claire Hann writes about the workshop, that she co-organised with Jennie Middleton as part of the School’s Athena SWAN programme. According to our most recent staff survey, one third of staff at the School of Geography and the Environment (SoGE) have caring responsibilities, either for children or other relatives, and many of them work flexibly in order to accommodate this. Yet the impact that people’s home situations have on their working lives is rarely discussed openly. An informal session on parenting and working in geography at the 2017 RGS-IBG conference brought this into focus. During that session people agreed on the pressing need for a frank conversation about the difficulty of reconciling academic ‘success’ with family needs. That was the catalyst for this month’s workshop in SoGE. The workshop began with a stimulating keynote speech by Parvati Raghuram, Professor of Geography and Migration at the Open University. Parvati spoke powerfully about care encompassing not only our caring responsibilities in the home, but our duty of care to colleagues within the academy – whether through mentoring, sponsorship, giving time to students, and so on. Drawing on her own experience of taking an extended career break and returning to work part-time, she offered advice and encouragement to those looking to (re)establish a career whilst managing domestic responsibilities. The three papers that followed drew on the speakers’ personal – and sometimes very raw – experiences, yet all three brought out some common themes. Vandana Desai (Royal Holloway) and Sally Lloyd-Evans (Reading) spoke about the feelings of invisibility and isolation amongst women academics working part-time, and the sense that the work they do is of less value because it doesn’t count towards the REF or other conventional measures of academic esteem. This theme was echoed by Natalie Ross (Manchester), in her very moving paper about her personal experiences of a ‘sandwich’ of caring responsibilities – looking after elderly parents and a young child. She challenged us not to hide our care work but to make it count, as there should be more to academic culture than winning grants and publishing papers in prestigious journals. The need to make compromises when working as both a carer and an academic was a recurring theme of the workshop, brought out particularly by Katy Jenkins (Northumbria) in her paper on combining motherhood with fieldwork. Being responsible for a family ‘back home’ restricts the choice of field sites, the length of time away, and the ability to focus fully on the fieldwork, as the ‘mental load’ of dealing with the minutiae of family life continues even at a distance. Themes from the morning session were discussed in more detail in small-groups discussions in the afternoon, focusing on how caring responsibilities impact on attendance at conferences and fieldwork, and the strengths and weaknesses of Athena SWAN as a tool to promote gender equality and a better work-life balance in academia. One of the aims of the workshop was to consider what practical steps can be taken to address the challenges identified. The suggestions included: distinct part-time promotion pathways, which recognise the type of activities more often associated with fractional working (such as teaching or editing textbooks) as well as acknowledging carer’s achievements before they took a career break; ensuring that funding can adapt to support changing mobility, so that staff can use grant money to employ field researchers if they are unable to do fieldwork themselves due to caring responsibilities; and valuing slow scholarship – that is, research that may take years to complete. To help counteract feelings of invisibility or lack of impact, the advice to carers was to find sponsors or mentors to help them maintain ambition and confidence; and to make the best use of their reduced working hours by collaborating with others, as well as taking on new responsibilities, which helps to raise their profile and increase the impact of the research they do. We hope that this workshop will be the starting point for further discussion and activities on care and academia here in the University and more widely. There is a huge amount of interest in this issue, which up until now has not received the attention it deserves. "One third of staff at the School of Geography and the Environment (SoGE) have caring responsibilities, either for children or other relatives... We hope that this workshop will be the starting point for further discussion and activities on care and academia here in the University and more widely.". Read more about Equality and Diversity work at the School of Geography and the Environment.